Compare HRM to a chest strap. Discussion in 'Apple Watch' started by 8CoreWhore, Apr 24, 2015. Can someone that has the Watch and a Polar or Garmin HRM that uses a strap, do a comparison? I've scoured the internet and not one knucklehead has done this. Not from runnersworld, Men's Health, Men's Fitness, etc. The HRM chest strap is the gold standard outside of being in the Dr's office hooked to a machine. The only way we'll know how well AW is, is to use both systems at the same time on the same run or bike ride. I was intersted in this as well and did read one review where they did a comparison. I'll try to find it. In any event it was quite positive. I am sure i read a review on this as well and seem to recall it said the AW was accurate for normal one of measurements but was unable to accurately track heart rate changes on any activity. In fact i seem to remember it saying that none of the wrist based devices are able to accurately track HRM on a run. I am sure i read a review .... In fact i seem to remember it saying that none of the wrist based devices are able to accurately track HRM on a run. Any reviewer saying this has no idea of what there is on offer regarding wrist HR monitors. Quite a number of devices out there specifically targeted at runners and other sports. Many devices from a company called MIO, and also the TomTom Runner Cardio which I have and works perfectly (compared with a chest HRM). By the way, there is a reason the sport model comes with a rubber band. Accurate monitoring requires a tight fit that will not move around during exercise. This is true of all wrist HRMs. Not a scientific study but I did compare my Apple Watch to my Garmin when cycling yesterday. Most of the time the Apple Watch was within a beat or two of the read out taken from the Garmin's chest strap. The only time that it wasn't in sync was when my heart rate increased quite a bit, for example going up a steep hill. It did catch up but appeared a few seconds behind. I'd don't know whether that's just a reflection of where the reading is taken (does it lag that much between chest and wrist?) or more frequent sampling by the Garmin chest strap. The same thing happened when slowing down, so I assume it's more down to sample frequency than anything else. Both systems measured a maximum heart rate of 157bpm and average of 125bpm so, apart from the lag when changing effort levels, it looks pretty accurate. i did find a couple of big down sides. Firstly the software side is nowhere as sophisticated as Garmin's with no way of setting heart rate zones (or at least any I could find) and no way of doing any real analysis of performance after a ride (also no GPS, but we all know that). This may be solved with software updates or third party software assuming they are allowed access to the heart rate monitor. Also I found actuall seeing where my heart rate was involved taking my hand of the bars to get the screen to wake up, which isn't exactly safe. In general riding, this would be less of a problem as I don't spend that much time looking at my heart rate, but I can't helping feeling that until battery life improves in some future model it will be a bit of a compromise. Overall then it looks pretty accurate and fine if you just want a general fitness monitor. For those who are more serious about training, you probably already have a Polar or Garmin system and for the reasons outlined above I'm going to stick with my Garmin. The accuracy is very close, based on every review I've read. The big difference is the frequency of the sample. The recode review indicated this by saying she had to wait for the HR to be displayed when using the AW, but with the strap paired to the AW via BTLE, the HR displayed immediately. The post just above this indicates the same thing by saying it took a bit for the AW to catch up to the accurate number displayed by the strap. Basically the AW HR monitor samples every 10 minutes when not using the workout app, and probably goes to something like every 30 seconds during workout. While a dedicated HR strap samples every second. This is just conjecture, hopefully the DCRainmaker review comes out soon. The sampling during a workout appears to be every 5 seconds. 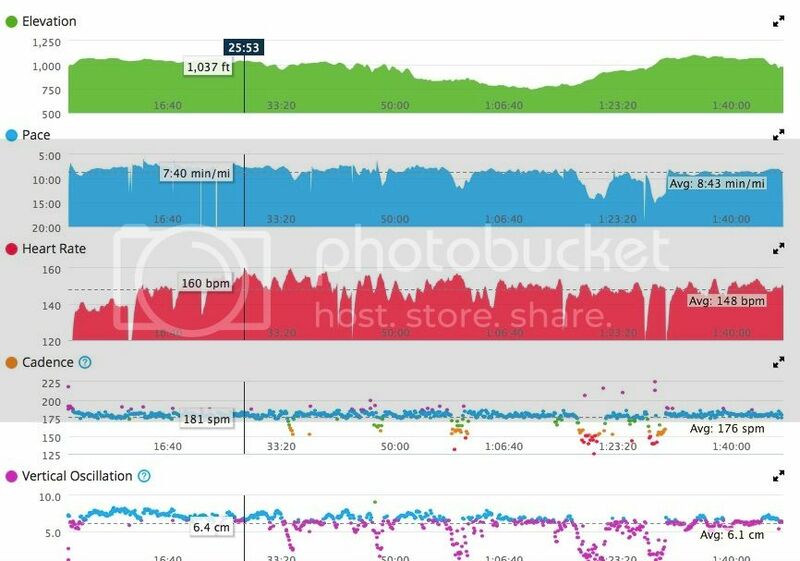 In the Health app you can see all the HR readings and during a workout there are 12 HR data points per minute. Thanks for the replies. I think the main feature most want while exercising is to set target zones, which the AW is accurate enough for, but lacks what other HRMs do - prompt us to stay in that zone if we fall out of range. Hopefully 3rd party apps will achieve this. So it's accurate enough, with some lag, but we need better software. Just completed a 12 mile run with my Garmin 620 and Watch The HR monitor is fantastically accurate and was usually no more than 4 beats off of my 620. The only exception was when I stopped at a street crossing and HR lowered. Then when I went back to running the Watch lagged behind some. One other slight problem. When first started I was getting extremely high readings. After a mile I stopped and tightened the strap 1 notch and it fixed the problem. Strange since I thought if too loose it would NOT read. Now if only Apple offered a way to graph your HR data. Another oddity (or actually 2) was how inaccurate the distance and calorie burn readings were. This is where I thought Apple would excel and had been working hard on. 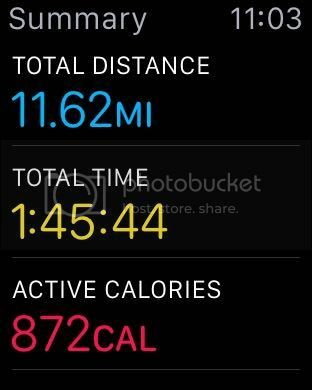 My Watch read 11.62 miles and only 872kcal (Garmin 1265kcal). Is there a way to compare your GPS track from the Garmin and what the Apple Watch tracked? No, Apple doesn't offer any mapping abilities. I did 6 miles with Apple watch on one wrist and Garmin 620 on the other, plus HRM strap. I don't see any chance of dropping the 620. I like 4 data points on the screen. Pace was off as well. It's serviceable but if you are used to a "real" running watch you won't be able to make the swap. Not yet. Your assessment of the Apple Watch's accuracy is based on a comparison with your Garmin 620 (especially with regards to distance and calories burned). Do you have any information that suggests the Garmin is more accurate than the Watch for those pieces of data? Is it possible the Watch is closer in accuracy than the Garmin? As evidence by my post I'm 100% with you. Looks like I'm going to be 2 watch running for at least a year or 2. Yes I do. I also used the Nike+ App on my iPhone and it recored nearly the same at 12.1 miles as my Garmin at 12.03. Plan on holding onto my Fenix 3 for working out but thinking about picking up the Watch for my daily wear. Just still not sold that it brings more to the table than the Fenix. Only thing I really feel I would like would be responding to text without pulling out my 6+. The app on the phone gives you the graphing and more granular detail. Remember the Apple app only estimates active calories, calories expended over and above your basal metabolism calories. I believe the Garmin and others estimate total calories. Not sure why the distance would vary though. The Activity App doesn't offer any HR graph and what it does is very primitive. I only see Stand, Exercise and Move and a Workout summery. Here is something like what I want. I did an 8km run today with an Apple watch on one wrist, and my TomTom Multisport Cardio on the other wrist (it also has an optical wrist based HRM). I also carried my iPhone (which I hate to do) to keep the Apple Watch as accurate as possible for distance and pace. I've been using chest straps for years and was quite happy to finally drop them when I started using the TomTom a year ago. The TomTom has always seemed to be quite accurate for me. Today I was pretty happy to see the HR on both watches were always quite close, many times when glancing they were even the same value. At the end of the run, they both calculated the exact same HR average for the whole workout. Absolutely agreed here. I love to see as many data points as possible with one glance. Usually time, distance, pace and HR. The TomTom actually annoys me that I only can see 3 at a glance without interacting. 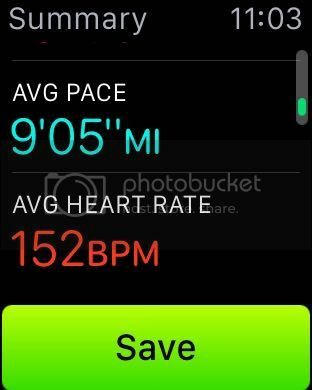 I was pretty disappointed to only see 1 data point on the Apple Watch when running. The pace for me was off as well quite often, which surprised me as it should be using GPS from the watch. Compared to mapping online, the TomTom seemed quite accurate, while the Apple Watch / iPhone was about 200m off the total distance. For serious running, I don't think it's a true replacement for a dedicated running watch, though I wasn't expecting it to be. I feel that in the future it could eventually gain GPS and improve quite a bit with native apps. Look at the activity app on your iPhone. How many total calories does it report for your workout? It will show active calories (your 872), plus resting (or metabolic) calories and give you a total. It will probably be closer to the Garmin 1265 but still less. I am finding the AW Heart rate matches my chest strap very closely but calories are being shown consistently less. But I don't know which is more accurate. Apple just did a lot of testing and analysis so maybe they are more accurate. I would like to see Apple share some of their test results. I have a stair stepper machine where I do a 40 minute workout. The machine reports 600 calories (without a chest strap) which I always knew was overstating calories burned. If I wear a chest strap I record 400 calories. With the AW it records 300 calories (229 active calories). I tested this today with my Bluetooth polar strap and it's pretty spot on. My chest strap tends to move around when I run and is uncomfortable. It needs to stay moist to work which can be annoying. However I'm keeping my polar chest strap because it's compatible with all the cardio equipment at the gym (Apple Watch doesn't have this antenna . Yeah the graphs are nice, although I'm in the boat that pretty much hates the Garmin Connect App. Does anyone know if the Apple Watch SDK allows for tapping into the workout/activity data for more granular views or is that something we need to wait for after WWDC and the native apps launch. Don't know, but the detailed HR data is in the iPhone health app. A developer could use that to create some workout graphs for an iPhone app which would be nice. Keep the reports coming, guys. We need the quality 3rd party apps to be able to tap into the heart rate data from the Watch so we can get all the info we want. But right now, I believe, the Apple WatchKit doesn't give developers access to HRM data - which is dumb. Come on Apple!